Thanks for update, we wish you all the luck. Bring it to iOS and see the revolution..
Do I take it from the embedded PowerPC comment that you will be dropping PPC support once LLVM is the compiler du jour? Good to know. I wait for monolithic and smaller apps and Cocoa for ages. I keep an eye on the evolution of RB for at last 3 years and never felt it ready for my needs and quality demands and desires. LLVM seems to be the way to go. I hope you guys can do it fast. May the force be with you. @ Konformagaitz - It's not easy to say at this point. We compiled the code for the app with LLVM but the framework itself is still compiled with GCC. The next step will be recompiling the framework with LLVM. Then we should see a size reduction. Wow this is really great news, the timing is prefect but about timing, what are we talking about? In a ball park so to say. @ Martin - It's difficult to say. Very math intensive code will see the greatest speed gain. UI code won't speed up as much if at all. Congratulations on achieving the milestone, Geoff. This is great news. Thanks for keeping us informed. ARM support is great! So it would be able to compile to Maemo platform? Or Meego? @ Mathias - it could compile for any ARM-based device but remember that's only compiling code. There would still need to be a framework provided for any new platform we were going to support. so if i have an ARM920T running debian, when in time will i be able to run my RB code on it? @ Martin - Good question. I doubt you will be able to this year because our priority will be getting Mac, Windows and Linux working for x86. But once that's done we can experiment and see what would be involved in supporting Linux on ARM. There's something that needs clarification here with regards to GCC versus LLVM and multiple architectures. Please understand that my comments have no bearing on RS' shift to LLVM and LLVM really is the best option for the REAL Studio environment. I simply provide it to offer a bit more information about GCC's capabilities since someone asked me off list about this because they knew we compiled for multiple architectures using GCC. Many comments in the mailing lists and the RS forums concerning the RS shift to LLVM to support multiple architectures may have people thinking that GCC is not capable of supporting such an effort. GCC is quite capable of compiling for multiple platforms and architectures on a single system as long as you have the proper build environment in place. For example, we have been compiling our Unix core app on an Intel-based Linux system using GCC 3.4 since around 2002. We compile for FreeBSD and Linux x86, x86_64, Itanium, PPC, SPARC, and Alpha, A/IX PPC and PowerRISC, Solaris SPARC and x86, HP-UX PA-RISC and Itanium, and IRIX MIPS. Granted, our build environment is relatively huge (around 7 GB) since we need to maintain the supporting libraries and headers for each platform, but it is quite manageable once you know how the pieces all fit. We use a chroot environment to segregate each platform and architecture. We may consider moving our environment to LLVM in the future, but for now, GCC gets the job done for us very well. @ TJ - Because GCC is GPL, it's not a option for us as a backend compiler. Apple is moving to LLVM from GCC for the same reason. @Geoff - I definitely understood and fully agree with your move (as I said). My point was simply to educate on GCC since some folks were under the impression that you had to change to get cross platform / architecture compiles. @ TJ - Ah. No, we didn't have to change for cross-platform. We have been compiling our cross-platform frameworks with GCC for Mac and Linux and Visual Studio for Windows for many years. However, your apps are compiled, not with GCC or Visual Studio, but with our compiler. We have decided to switch our backend compiler to LLVM because there are a lot of benefits to doing so and few downsides. GCC would not have been an option for us to use as the backend for our compiler because of its GPL license. When you are compiling through LLVM, does that mean you will open up other Frontends for other dynamic languages, e.g., Python? @ Hank - Supporting other languages would be a big job and LLVM won't really help with that. 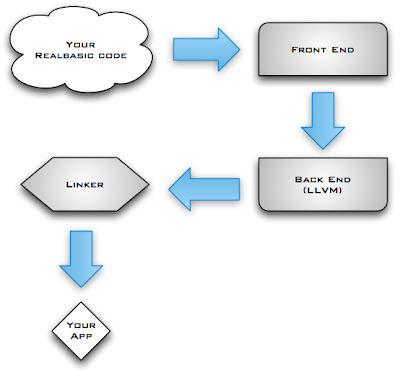 iOS framework support would be killer vector for corp programming. I see great opps for factory floor iOS apps to monitor all the machinery and what not. Hey Guys, I've been watching the RS blog but haven't spotted any updates on this recently. Is the LLVM back-end still being actively worked on? @ MacATDBB - We have been keeping RBScript up to date with the latest versions of LLVM. Work on building apps with LLVM will start once we are finished with 2013r1.